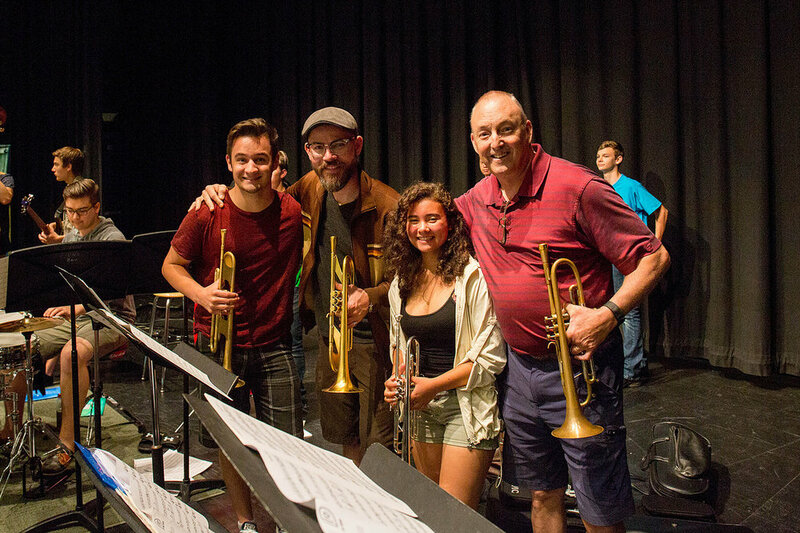 Students who attend our music camp and festival experience an intense and rewarding week of instruction with a hand-picked faculty of nationally-acclaimed music educators. The ratio of teachers to students is 1 to 4, and this key feature of the program insures a close and collaborative learning environment for the student musicians. There are many opportunities to play alongside the faculty, and the BHMF students report to us every year, through their Student Survey comments, how dedicated and encouraging their teachers are, and how much they have learned – as well as how much fun they had! Bios for the BHMF instruction faculty can be found here. Each year, Camp attracts a diverse group of music students from the U.S. and Canada. Camp can accommodate 60 -100 students for the week-long program. Some local students will choose to commute to the festival. There is also a room and board option. Boarding students stay at Camp Horizon (7506 Gemini St in Birch Bay/Blaine). Students will be transported to and from the camp via a Blaine School District bus and driver. Emailed letter of recommendation to abj3@comcast.net? 1. The student completes this form. A parent or guardian may also assist. Decisions on scholarships will be made by June 15th and applicants will be notified by phone or email directly. Boarding students stay at Camp Horizon (7506 Gemini St in Birch Bay/Blaine). Students will be transported to and from the camp via a Blaine School District bus and driver. To register, please select the camp program you are interested in; Jazz, Vocal, New Directions or Let’s Rock, fill out the registration form and submit. Proceed to checkout and secure registration with a $100 deposit. Tuition for the week-long music camp and festival is $495 and includes admission to all concerts and events. · A minimum $100 deposit is due at time of registration. Full tuition and fees are due by June 1, 2019. · Private lessons (optional) are priced at $25/half hour. Due to time constraints, private lessons are limited to two lessons per student. · For boarding students, room and board (lodging, breakfast, lunch and dinner) is priced at $400 for the week and include transportation to and from festival events. · For those commuting to the festival, lunches are available for an additional fee of $60. · Commuter students can also request both lunch and dinner during festival week for $120. Placement auditions and ‘first meetings’ help our instructors place students into groups so that each one can have an enjoyable and challenging musical experience. Auditions take place on Sunday, Registration Day. After students are registered, there will be a 2:00 pm General Meeting for all students, family, staff, and faculty in the Blaine Performing Arts Center. Auditions (or first meetings) will take place following the 2:00 PM General Meeting. Note: “New Directions” Camp students must email a sample of their playing in advance, as instructed below. For this first meeting, vocal students should prepare and sing a song of their choice. Jazz instrumentalists will audition for placement in various jazz bands or the Let’s Rock class. Jazz auditions will be held in faculty studios/classrooms. Room numbers to be announced at the General Meeting. · Approximately 2 minutes of music that best displays your full abilities on the instrument. This music can be all or a portion of a solo piece, etude, study or any other music of your choice that gives a good idea of your level of play. · A scale that demonstrates a player’s full range on the instrument. The recording should be less than 3 minutes in length and can be done on a simple recording device such as that found on most smart phones. Send the recording by email to Charlie Porter at: hotlipsporter@gmail.com Please send this as soon as possible following your online registration. Direct any questions you might have to Charlie at the same address. The ND first meeting will offer an introduction to musical memorization and improvisation, as well as a chance to preview some of their new music. Jazz Instrumentalists in the morning are enrolled on the basis of audition into a Jazz Band or the Let’s Rock Ensemble*. Jazz Bands rehearse and perform traditional and cutting-edge charts from the jazz band repertory. The Let’s Rock Ensemble is made up of rhythm section players who explore the works of rock, blues, latin and other contemporary and jazz forms. The morning also offers master classes, workshops and sectional rehearsals for all instrumentalists. *Note: Placement in Jazz Bands and Let’s Rock is by audition. However, rhythm section players (keyboard, guitar, bass, drums) who prefer to play in the Let’s Rock program can notify teachers during the audition process on opening Sunday. Jazz Instrumentalists achieve a comfort level as combo musicians by playing in a combo and in a jazz lab in the afternoon. The afternoon also offers an opportunity to play in a traditional jazz (Dixieland) ensemble. Development of improv skills is emphasized. All groups, large and small, participate in concerts throughout the week. Jazz Vocalists work in Solo Vocal Performance, Vocal Jazz Ensembles and Songwriting. Solo Vocal Students will receive daily coaching as they develop repertoire while working on tone, phrasing, style and improv. The Jazz Choir rehearses and performs stylistically varied jazz choir repertoire while Songwriting students create and perform original pieces. A resident faculty combo is available to accompany all vocal jazz performers and we offer an opportunity for select vocalists to perform with the festival studio band. The New Directions program offers young musicians who play typically classical instruments an opportunity to perform an eclectic mix of musical styles ranging from classic to modern post 20th century which may include rock, jazz, fusion, folk and new age. Improvisation and playing by ear are emphasized. The music is newly composed by our faculty and students each summer. Students and faculty perform in the New Directions large ensemble in the morning, breaking into combos/chamber groups in the afternoon, where students compose and perform their own music. Instruments included in the Classic to Contemporary Division include orchestra strings and woodwinds, tuba, guitar, piano, percussion, guitar and voice. Students in the Let’s Rock track spend mornings rehearsing with the the Let’s Rock Ensemble, made up of rhythm section players who explore the works of rock, blues, latin and other contemporary, popular, and jazz forms. The mornings also include master classes in each instrument. Afternoons are spent in a jazz combo and in the Jazz/Rock rhythm lab, which includes performing works by our Songwriting students.